Racer X: Justin, Monster Cup last year, you showed up on a bike. All of a sudden you get a ride. Supercross comes, you put some great rides. An injury. Then we come out here and it looks like you haven’t missed a beat. Take us through the afternoon here with the third. 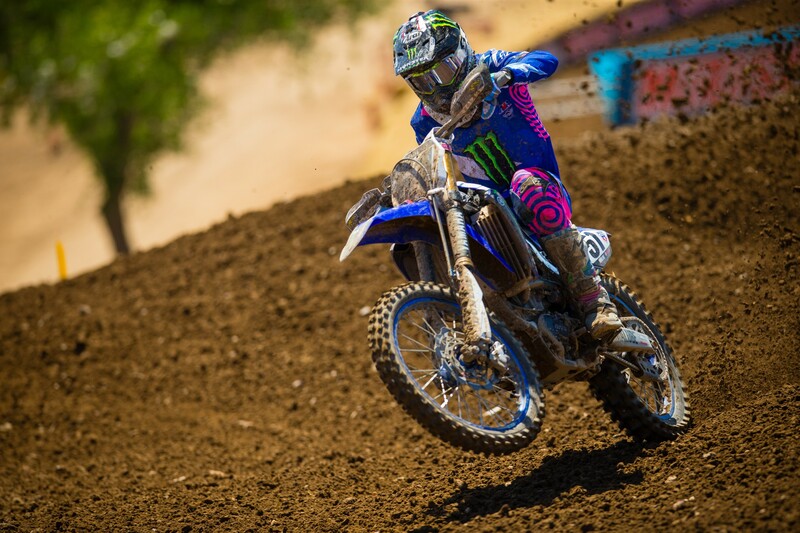 Justin Barcia: Yeah, it was a good day. I had a lot of fun. The track was super rough. It was a little different than usual. It was a little more hard-pack, a little more square-edged. It’s usually a little deeper. But everyone had to ride it. There were some new sections which I enjoyed, the whoops and off-camber too, which was cool. Had a good day with my bike. I made a few little changes here and there. Was super comfortable for the most part. The only issue was really me. I was a little tight in the early on parts of the races, but I’m happy with how the day went. Third on the podium is great. I think I have a lot to build on, which is a good thing. Marvin, you were able to come across the line in second. I think that was a nice, solid start to the year. Take us through a bit of your afternoon. Marvin Musquin: Yeah, it’s a repeat of last year, I guess. But the first round, to get a second place is a good start. The second moto, I got squished up the start and me and Eli were a little bit on the back. I’m like, it’s going to be a tough one. I was able to come back to the lead, which was awesome. I’m really happy about my riding. It’s the first race with the new bike of this year, and we’re not too far off being 100 percent. I’m looking forward to next weekend. Glad I start the year off right, I would say, and try to get better next weekend. Eli, from your rookie race, the first time you’ve turned pro, we’ve celebrated the champagne shower down there, and here you are again, firmly in control of the season so far. Round one, 50 points. How’s that feel? 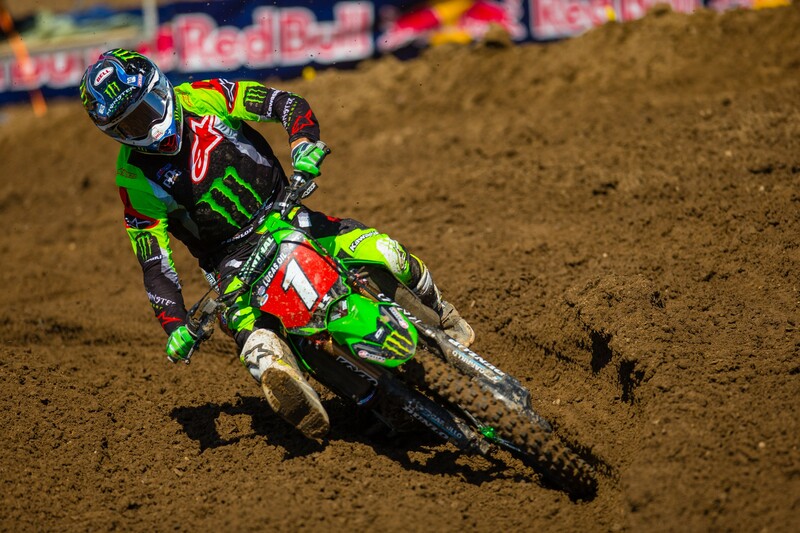 Eli Tomac: It’s awesome. It wasn’t an easy day at all, though. Second start was not good at all. Huge moment over the tabletop. Went flying off the track a little bit. Luckily was able to get to the front pretty quick there. Had one little tip-over too, but overall felt really good on my motorcycle. It was just an easy day on the bike. Things are clicking. We can have days like we had. Eli, in that second moto, did you make a conscious effort to kind of drop the hammer in the second half? It looked like you really sped up. Tomac: It’s tough to say. I just was able to ride good the last 15 minutes. I was loose and I never really got that tight today, so that was huge, especially for the first race today. I just was riding comfortable. For all three of you guys, how tough is it coming from supercross just two weeks off to get your motocross legs back and just get back to racing outdoors? Barcia: I don’t think it’s too bad, really. Obviously, we’d like a longer break or something, but this is just how it goes and this is what we do. So yeah, you always want more time on the bike to get ready for outdoors and whatnot. You can never have enough time, I feel like. It’s a little difficult, but it’s what we do, and we’ve been doing it for a long time now, so we just kind of go with the flow. Eli, you went faster after the fall. Did that fire you up? Did you get a sense of urgency, like, “Oh, man, this might slip away”? You started going into the 2:19s. Tomac: I was comfortable. I was able to just kind of keep creeping up the pace. There was only one option, and that was to start pinning it and just try to catch back up. Your starts looked good for three-quarters of the start in both motos, and then what happened there going into the first turn? It didn’t look like you got buried early. Tomac: We just talked about that at the truck. It was good for three-quarters of the way down the straightaway, then I don’t know if I was letting off or what. That was weird. I need to be better at that. Marvin, you mentioned, and Blake [Baggett] mentioned it too, that you have new bikes. So how different is it? It seems old because you raced the whole supercross season on it, but how big of an adjustment is it going to be here? Musquin: It’s coming out of supercross, obviously it’s a big change, but it’s the first year we raced this bike outdoors. Obviously, we testing a little bit, but when you think about it, it’s only been two weeks since Vegas supercross, but I think the bike is great. A little tune-up here and there and we’ll be good. I think the riding was pretty good today. We’re not too far off, and we’ll get better for sure. You were battling Eli almost exactly like you were in the second moto last year. Did that run through your mind? It was even some of the same sections where you were battling each other. It was deja vu. Did it seem like that? 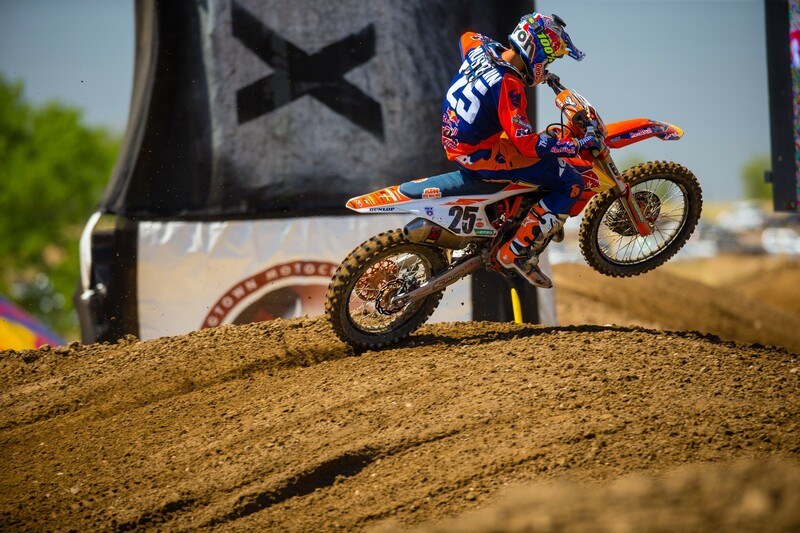 Musquin: Oh yeah, for sure. Definitely think about it while I was out there. I think it was first moto where we actually went off the half pipe exactly like last year. I thought I was going to do the exact same move as last year, but it didn’t work out like that. Eli went a little higher than what I expected. I couldn’t make it happen over there. But anyway, I think it was fun to watch, and at least it was a battle up front. Eli, you won here last year and then had some bad luck at Glen Helen and had to dig yourself out of a hole. Is there anything you can point at that you can say, if I can avoid this and that? Is there anything under your control to try to build this momentum throughout the year, where last year you were not able to do that? Is there anything you can change? Tomac: I don’t know. Last year was kind of a fluke thing. I forget what exactly it was. The front brake again, I was just getting roosted. I guess the only way you can control that is getting the holeshot. That was just dirt bike racing. The 250s were concerned about some of the jump sizes they’re building at Glen Helen for next week. They had mentioned it. What’s your take as a collective group on what to expect there? Barcia: They usually go way too over the top. It’s kind of crazy. Jumps are cool for sure, but when you’re racing 30 minutes plus two laps, then it’s not that cool, really. You guys can say too. Tomac: I’m not all for it at all. If you’re by yourself cruising around, no big deal, having fun in the hills or something, but there’s 40 guys. There’s no need for that for our racing. Not safe for anyone. Really not cool. Musquin: Actually, we talked about it. I think it was two or three years ago they had built big jumps, and we had the same conversation. I don’t know if they didn’t hear us or something, but I saw on Instagram the big jumps. I agree with those guys. It’s fun maybe at practice, but when you race 30 minutes wide-open, and especially if it gets rough, I don’t know. But we’ll see how it goes. Here there was a big triple, and they took it off and built whoops. Barcia: Whoops and stuff are much better. Maybe we can get the AMA to have a look at the track when we go next week for press day and we could all kind of have a riders’ meeting and talk about it before the race. Maybe we can tell them to stoop the jumps down a little bit, make it safer. The faces are like full-on supercross, but double the size. Tabletops are cool, but massive doubles that are super dangerous, especially when they get kickers. We’re not being prima donnas, but those are big jumps. We wrapped up the 250 press conference with this question as well, and I know it pertains slightly different to you. Motocross of Nations coming to America—6it’s always a big thing, and it’s only been here four times. If you were selected for the team, would you go? Barcia: I would send it. Tomac: Yup, I’d be in. Marvin, if your country calls for you to answer the call, will you be there as well? Musquin: Yeah, I’ve raced RedBud for years, so it’ll be cool to go there for Motocross of Nations. If it has to be Motocross of Nations here in the U.S., RedBud is the perfect track.